When I opened my email inbox this morning, I found a string of delightful messages from a museum curator in Alberta. She and I had met a few years ago when she came to see my solo Theatre Royal show The Bride of Barkerville, a dramatic interpretation of Miss Florence Wilson’s adventures in British Columbia between 1862 and 1875. The curator and I chatted for some time after the show, and she told me about the in-depth research she has recently been engaged in concerning the history of a another historical woman who had lived near Lethbridge. We have kept in touch a bit, the curator and me, and when I turned on my computer earlier today I was delighted to find she had taken the time to send me several links she had found to 1860s newspaper clippings featuring my Miss Wilson. It was so kind of her to have done this, and such a generous display of research sharing. When I began my museum career in 1989, the internet was still a few years away from becoming the vast, international phenomenon of information distribution upon which we have become so dependent. Back in those days, when we wanted to find obscure bits of information hidden away in old newspapers or letters or diaries, we actually (gasp!) went to archives and records services. We physically perused the collections. We looked in books, and made (landline!) phone calls. We also sent letters (by regular mail!) to museums and archives requesting information; information that could take weeks to receive. For the past decade or so, museums around the world have undertaken the herculean task of digitizing historic documents. More and more often, the information we as researchers seek can be found in international collections that are now instantly accessible from the comfort of our own homes. As a result, ridiculously patient researchers like me are in a zeitgeist of history-nerd heaven. We are now making discoveries and connections at a pace unaccustomed to, in a field where it can literally take decades to uncover the tiniest morsel of fresh information about a historical person, place or event. And yet, there is still something so very special about actually travelling to a museum, or digging through an archival collection to get your hands on a real, non-virtual, dusty old bit of stuff. Several years ago I wrote a one-man stage play about the town of Wells, called The Fred Wells Show. It debuted at the Sunset Theatre in Wells (a theatre that was originally built by Fred Wells and the Cariboo Gold Quartz Mining Company in 1936) and my actor-interpreter husband, James Douglas, has been performing the show on a regular basis ever since. In fact, as I write this very sentence right now, James is across the street at the Sunset Theatre performing The Fred Wells Show, after having already performed it this afternoon at the Theatre Royal in Barkerville. While originally researching The Fred Wells Show I happened to be living in Victoria, with full access to the British Columbia Archives and Records building, beside the Royal BC Museum. I cannot adequately communicate the thrill it gave me to request the original letters that Mr. Wells himself wrote and received during the Cariboo gold town’s founding days. I sat there in the research room silently holding the same pieces of paper that Fred Marshall Wells had written upon. I was also able to read the entire scrapbook of one of Fred’s partners in the Cariboo Gold Quartz, Mr. Oscar Solibakke, and the original document was so big I had to stand up from my desk just to turn the pages. The scrapbook was an incredibly sweet and lovingly kept assortment of newspaper clippings about the mine in Wells, carefully pasted onto pages with a plethora of personal notes jotted down in ink in the margins. It was a delightful experience, and one I will never forget. I think that one of the reasons people connect so deeply with a place like Barkerville is because at this particular moment in our history, when so much of our time is spent in cyberspace, our primal selves crave the humanity of walking streets that are washed with the patina of time. We need to breathe in dusty air and to listen to stories spoken by a person who is present, unplugged and real. The digital age has brought so much to our lives in such a short time. It has been a wondrous boon to researchers, but our human hearts know that real connections are made between people, not devices. I am very grateful for an internet that allows me to communicate with a woman from Alberta, who was kind enough to remember me, and Miss Wilson, and to hold both of our stories in her mind so that we can find simple joy together in sharing a newspaper clipping from 150 years ago. I am equally grateful, however, for places like Wells and Barkerville; places that spark interest not through the world-wide-web but through cobwebs and old buildings and stories told out loud. 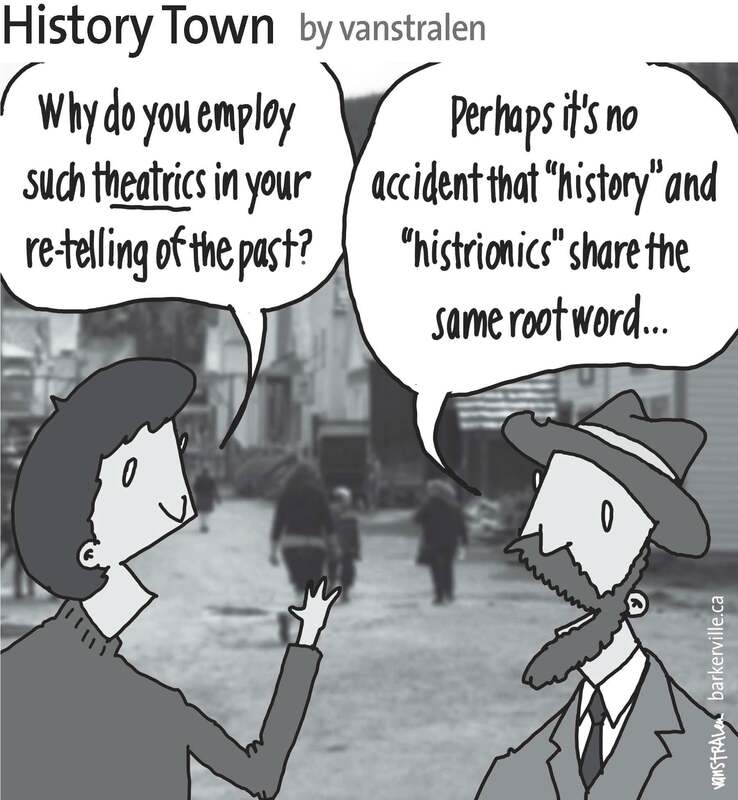 The above one-panel cartoon (originally published July 5, 2014) by Dirk Van Stralen, with accompanying editorial by Danette Boucher, is the eighth of twenty weekly entries that were logged – and subsequently blogged – as part of a 2014 collaboration between Barkerville, British Columbia and the Prince George Citizen aimed at introducing some of the quirkier advantages to living, working, and playing in the Cariboo Goldfields. We hope you enjoy! I thoroughly enjoyed this little onsite! Thank you for sharing…. it is appreciated!